Queen Victoria enjoyed a $40 million refurbishment in 2017, which involved slicing off the back of the ship to add 43 new cabins, and, in the process, increasing the size of the aft pool deck. The month-long refurb also saw the addition of a new dining room, a new specialist café and significant refurbishments to five Penthouse Suites and four Grand Suites. As a result, passenger numbers have increased to 2,081 (from 1,988). It re-entered service on June 4, 2017. Queen Victoria is elegance personified. In typically understated British style, the ship doesn't do glitzy or loud, so ambience overall is modest rather than striking. Do not expect even the slightest hint of neon or glitz nor -- perish the thought -- rock climbing walls or bumper cars. Luxurious furnishings and eye-catching features lend an air of extravagance to the onboard atmosphere with muted colors and lots of dark wood. Architecture is in keeping with the ambiance of Cunard ocean liners of times past while the interior design offers the contemporary elegance of a modern luxury hotel. Cunard cashes in on its impressive heritage, sense of occasion and somewhat old-fashioned pursuits including ballroom dancing and bridge. An outdoor Games Deck harkens back to the days of the '20s and '30s with croquet, shuffleboard, hoopla, deck quoits and paddle tennis. No hint of brashness here. Loyal followers also totally approve of the fact that the cruise line employs a stricter dress code than that followed on other mainstream lines. Queen Victoria is almost a replica of her bigger sister Queen Elizabeth, at least as far as layout, cabins and enrichment programs go. One difference is that the decor throughout the ship is darker Victoriana rather than Queen Elizabeth's lighter Art Deco-inspired interiors, but the public areas of the ship are every bit as splendid with an earth tone color palette of creamy beige, chestnut brown and gold, with mahogany walls, circular hand-woven area rugs and intricately designed marble floors. Everywhere you turn there is a treat for the eyes, from the glittering chandeliers and white gloved waiters serving scones at afternoon tea to elegant restaurants and deep, rich carpets. One of the ship's signature features is the stunning three-tier Grand Lobby with its unique artwork, sweeping staircase and sculpted balconies. With a dramatic triple-height ceiling, the -lobby serves as a majestic focal point and is the center of onboard activity. It forms the core from which the ship's other public rooms flow. A bronzed-effect sculptural representation of the cruise ship emerging from a sun motif coordinated with a marquetry relief depicting a map of the world graces the staircase landing and is visible from nearly every part of the Grand Lobby. The 4,000 square foot Royal Arcade on Deck 3, inspired by the Royal and Burlington Arcades in London, features a grand staircase at the forward end. Light wood paneling contrasts with green marble and gold and white stone textures. The centerpiece of this area is a custom-built, chiming pillar clock by English clockmaker Dent & Co., clockmaker to Queen Victoria and whose most famous work is Big Ben in London. The clock housing is black with gold-leaf lettering and backlit dials are opal acrylic with black Roman numerals. However, while all of this may sound very posh, this ship is not just the preserve of the wealthy. During the day you can relax and unwind in the Royal Spa while at night there are live theatre shows, music and dancing in the bars and lounges. The ship has enough classy, small to midsize public rooms and various nooks and crannies for guests to relax, read or enjoy a drink and a chat. A refurbishment in January 2015 saw the addition of nine single cabins while carpets, mattresses and paint work were replaced or refreshed. Eight new Internet stations were added to the upper floor of the library and awnings were installed at the back of the Lido and Upper Grill Terrace. Like the other Cunarders, Queen Victoria operates a class system in which the cabin grade you choose dictates where you eat. This means for those who want to splash the cash, the Queens Grill and Princess Grill provide top notch accommodations and more upmarket dining options. Having said that, around 80 percent of passengers are happily ensconced in Britannia-grade cabins and dine in the stylish Britannia Restaurant. Passengers' peace is not disturbed by multiple announcements either -- there is just one announcement a day -- at noon, by the captain, telling of the ship's progress. As far as service goes, in the main, the overall quality is satisfactory. Most staff members are friendly though some are unresponsive while others are rather inexperienced. The majority either speak excellent English or have a good grasp of the language. 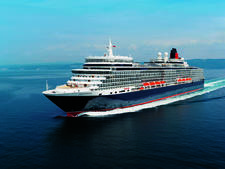 To sum up, Queen Victoria is a comfortable, graceful cruise ship best suited to couples, single travelers and mature cruisers. 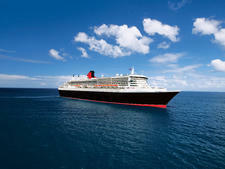 For first-timer cruisers, Queen Victoria is a good choice. It isn't one of the huge cruise ships so has a more intimate, friendly feel. Also a plus point for those new-to-cruising is that they won't get lost trying to find their way around. Cruisers -- especially those who enjoy dressing up for dinner -- can expect an elegant experience on this well laid out ship. The average age of passengers who sail on Queen Victoria tends to be from late 40s upwards. On roundtrip cruises from Southampton, passengers are mainly British, while voyages departing from other ports - - while still heavy on Brits - - attract Americans and Australians with a good smattering of Europeans and Asians. Those who travel on Queen Victoria are generally well-heeled people and most are regular cruisers. Many dyed-in-the-wool Cunarders wouldn't dream of sailing with anyone else. Queen Victoria attracts mainly couples -- both straight and gay -- and a few single passengers. To that end, the ship offers singles meet-ups including coffee mornings. It is not really a family-oriented ship, although it does offer excellent kids' facilities. Cruise Critic’s professional photographers and our extraordinary community members have taken 1,951 pictures of Cunard Queen Victoria. When you visit our photo galleries, you can be assured that what you see is what you get. On a seven-night cruise, there are two formal nights; longer cruises will have three or four. Some have a theme, such as the Black and White Ball, a Cunard tradition that includes the classic 'Officers Gavotte' dance. Dress code for these formal nights translates as dinner jacket, tuxedo or dark suit with tie for men, and a range of men's formalwear is available to hire onboard for anyone who does not wish to bring his own. Men can also wear formal national dress or army uniform. For ladies, formal nights mean evening or cocktail dress. Many ladies go all out to impress by wearing floor-length gowns covered in sparkles or sequins; some wear fascinators in their hair, carry glittery evening bags and are adorned with plenty of look-at-me jewelery. Ninety percent of passengers adhere to the dress code on formal nights, which is as it should be; this ship is elegant and guests enjoy looking their best as part of that experience. Other evenings are designated 'informal', which on Cunard does not mean passengers can turn up wearing anything they choose. For men, a jacket is essential, and although a tie is optional, many older men still wear one. Ladies wear cocktail dress, stylish separates, a smart trouser suit or equivalent. There are many ladies who still wear floor-length gowns on these informal nights. After 6 p.m., shorts and denim on men and women and sandals and sleeveless tops for men are considered inappropriate wear onboard. Anyone who really does not want to dress to impress can opt out by eating in the Lido buffet on Deck 9 or relaxing in the Winter Garden on the same deck. However, they are politely advised to stay away from other areas on the ship, especially the restaurants, out of respect for fellow passengers. A gratuity of $12 per passenger, per day, is automatically added to passengers' onboard accounts, but you can have gratuities removed by visiting the guest services desk while onboard. However, if you opt out of paying the daily gratuities, the staff you don't see, such as the kitchen staff, don't get any tips. A 15 percent service charge is automatically added to bar bills -- with a space for an 'extra' gratuity. Cash tips seem to be expected by some of the waiting and bar staff. A gratuity of 12.5 percent is added to all spa treatment bills, though passengers can also add more if they wish. Despite the ship's typically British ambience, the onboard currency is the U.S. dollar.